We are also proud to offer fresh chickens processed, bagged and ready for your table or freezer every few months. We raise the standard Cornish cross meat birds on a regular basis. Also, we hatch our own dark Cornish crossed with our mixed flock of laying hens and specialty meat birds (red broilers, black broilers, etc.) upon request. Stewing hens are generally available in the late fall. Poultry prices vary but are generally about $3.35/lb dressed weights. If you would like the liver, feet and gizzards, please let us know in advance and we will add these to your order. Corn/soy free cornish cross chickens available upon request. Approximately $4.35/lb. Minimum order, 20 chickens. Please contact in advance. 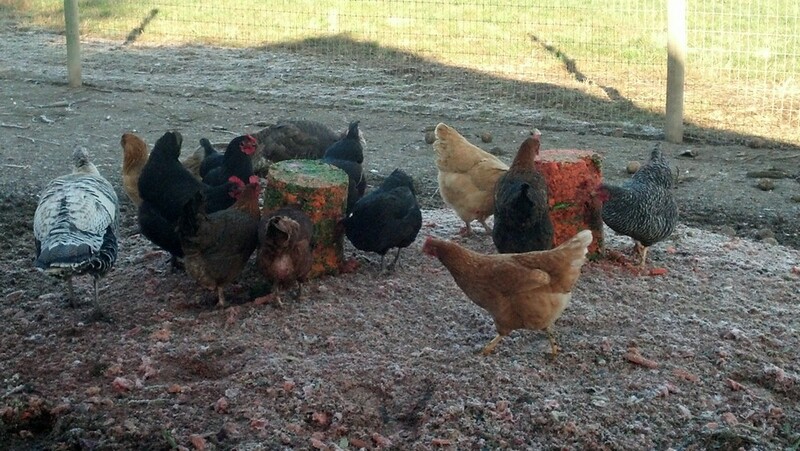 Turkeys and chickens enjoying a bucket of juice pressings from our friends at Portland Juice Press before being turned out to range in the grass field. Free range eggs. Eggs are mixed colors/breeds and are $4.25 per dozen. We regret to inform you due to time commitments we are unable to continue selling eggs via Flying Fish Company on 23rd and Hawthorne in Portland, Oregon (www.flyingfishcompany.com). Each year we raise a select number of broad breasted white turkeys for the winter holidays. If you are interested, let us know and we will reserve one for you. Supplies are limited so let us know as soon as possible. Broad breasted turkey pricing is also about $3.50/lb. These birds generally range from about 18-32 lbs dressed weight so let us know the approximate weight you would like. Narragansett, blue slate, royal palm, etc. Yes, we have a great selection of heritage turkeys as well. Most are pure bred with a few crosses. These are a true gourmet treat. They typically weight about 10-14 lbs dressed weight and are generally about a year old and pricing is in the $6.00/lb range. 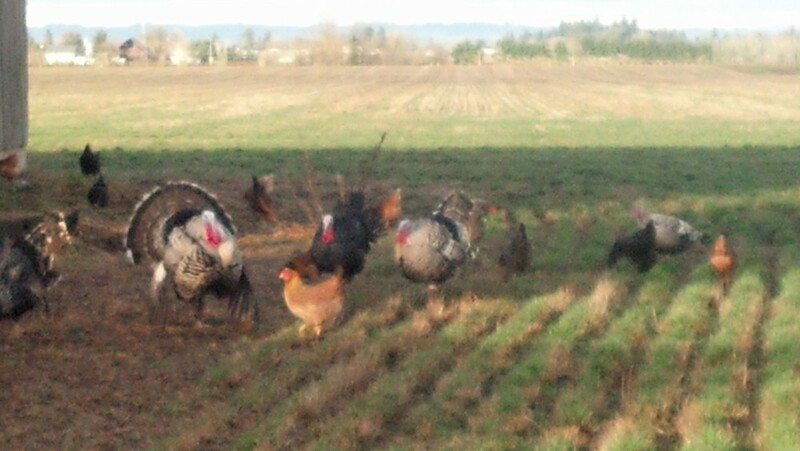 Please contact Carl Buchholz at 503.887.2465 for any poultry requests.